Sometimes it’s good to revisit an old idea. That’s what Chua Khim Teck, founder of Hibernater.com, did when he took an idea he was working on when he was still in school and gave it new life. Hibernater‘s concept is simple – it allows user to put their work states into ‘hibernation’, a process which allows them to save their work profiles, such as documents and the websites they have been surfing on with and resume the profiles with one simple click on a different computer or work station. “I was thinking for a final year project back in Ngee Ann Polytechnic in 2003-04 and I thought about what I need to “routinely” do everyday for my work. I realized that saving and resuming my stuff when I was about to log off the computer was quite a hassle to me.” He says people he initially spoke to were against the idea, since most people carried laptops. “But I held on to the fact that a lot of people in this world do not own laptops like we do, such as those in less-developed countries. Even for people who own laptops, there are several disadvantages to bringing the laptops everywhere we go, such as losing the laptops and the additional load of carrying a laptop around,” Chua explains. 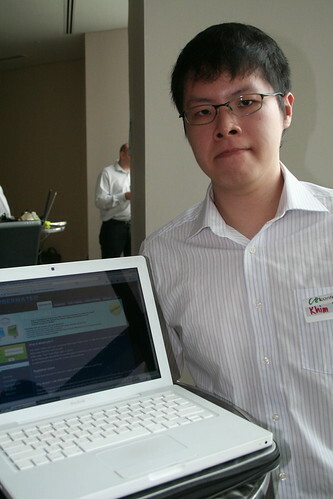 After graduation, Chua and his team mate Thien Rong tried to develop Hibernater into a commercial product, but they were forced to put their plans on hold when they were drafted for National Service. Hibernater was, ironically, left in hibernation for more than two years as they served out their military service. When they finally left National Service and entered Nanyang Technological University, they rebuilt Hibernater with newer techology and submitted it for the 2007 Microsoft Imagine Cup. They didn’t manage to enter the finals, but Hibernater received great feedback from some of the judges. Soon after, the team met Nicholas Chan from Azione Capital and managed to secure some funds. “There’s a huge silent majority market that is still sticking to desktop-bound applications,” says Chan, founder of the privately-held business incubator, who sees Hibernater operating in the vast majority of Asia which is still under-served by IT. Chan thinks Hibernater will be most effective in serving consumers “at the bottom of the pyramid” as it allows multiple users to share a single computer and yet provide each of them a private “virtual space”. “Besides,” Chan says, “I was impressed by the Hibernater team’s great attitude and humility.” Hibernater received from Azione Capital a seed funding S$62,000, which included S$50,000 from the Media Development Authority of Singapore (MDA)‘s iJAM microfunding. Hibernater announced its beta launch in Sep 2008. One of the challenges they have is in improving Hibernater‘s user interface. “It is important to have a user-friendly interface so that users can easily use the service,” says Khim Teck, but he shares that improvements are in the works. “We will be adding more support to as much applications as we can, and more enhancements to the interface will be done. More storage, over the web Hibernation, and so on,” Chua says.